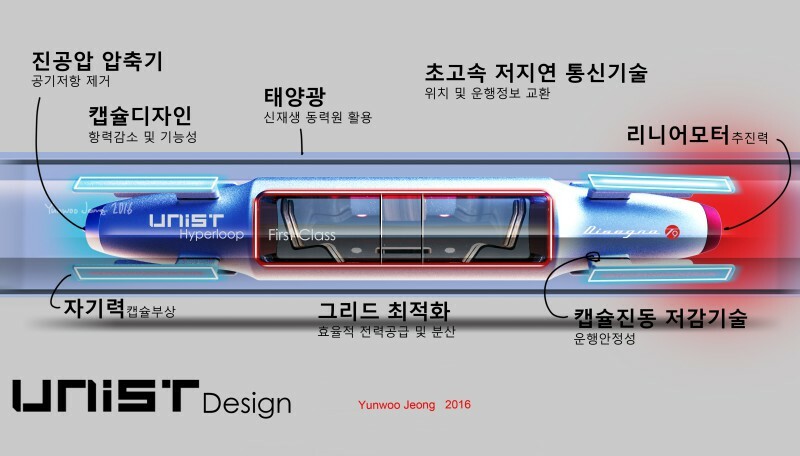 The UNIST Hyperloop passenger transport capsule conceptual design, created by Prof. Yunwoo Jeong (School of Design and Human Engineering). 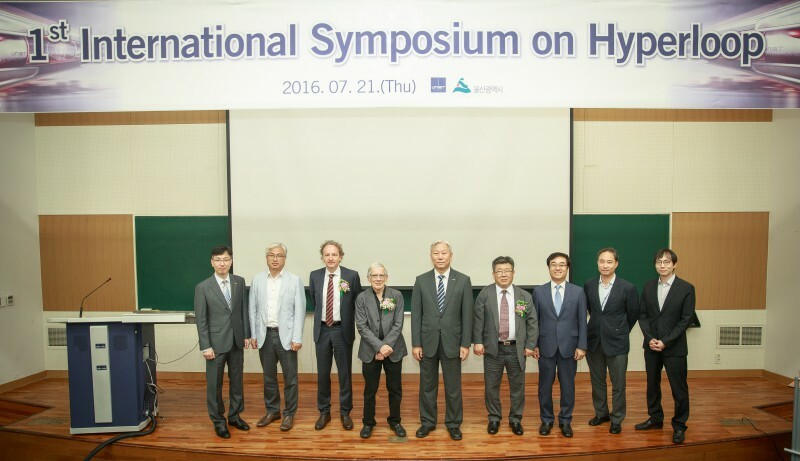 The 1st International Symposium on Hyperloop, Held at UNIST on July 21st, 2016. Futuristic Transportation System: Imagine Seoul to Busan in 16 minutes. Imagine one could make a train trip from Seoul to Busan in about 16 minutes. This may sound implausible, but a team of researchers at UNIST are developing core technologies to produce a new form of futuristic transportation to bring that dream to life: the supersonic Hyperloop, a pneumatic train powered by magnetic attraction that would surpass any commercial mode of transportation. On July 21, UNIST held the 1st International Symposium on Hyperloop, bringing together notable speakers and Hyperloop professionals around the world in an open dialogue, under one roof to discuss future direction and current status of Hyperloop research, as well as related technologies, such as magnetic leviation trains. 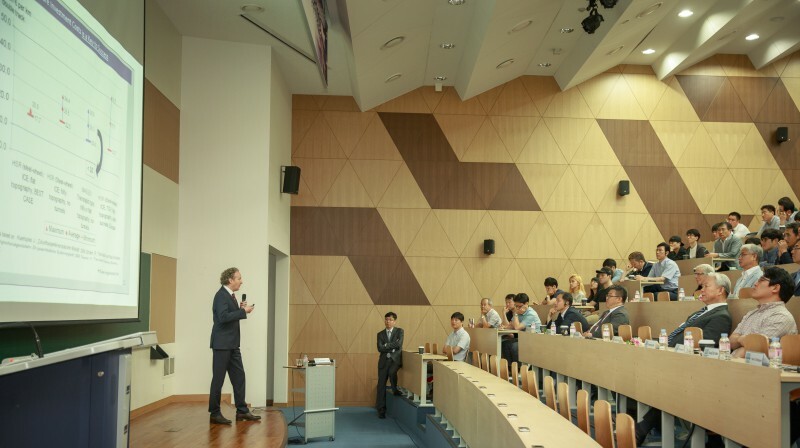 The symposium has been attended by President Mooyoung Jung of UNIST, Prof. Jaeseon Lee (School of Mechanical and Nuclear Engineering, UNIST), Prof. Franklin Bien (Dean of Public Relations & International Affairs, UNIST), Prof. Craig Hodgetts (UCLA), Prof. Johannes Kluehspies (Deggendorf Technical University), Dr. GwanSub Lee of Korea Railroad Research Institute (KRRI), and Dr. HyungSeok Han of Korea Institute of Machinery and Materials (KIMM). The idea for Hyperloop, the new high-speed ground transportation system by which commuters shoot between cities at speeds of up to 760mph (1200 km/h), was initially dreamed up by Elon Musk of Tesla and SpaceX fame. Meaning that these futuristic capsules would be zipping along at almost 500 mph (800 km/h)–faster than most commercial airliners and four times faster than the KTX. Moreover, by reducing air resistance, friction and maintaining a constant speed with a uniform inertia, Hyperloop can theoretically achieve supersonic speeds at less expense of energy. 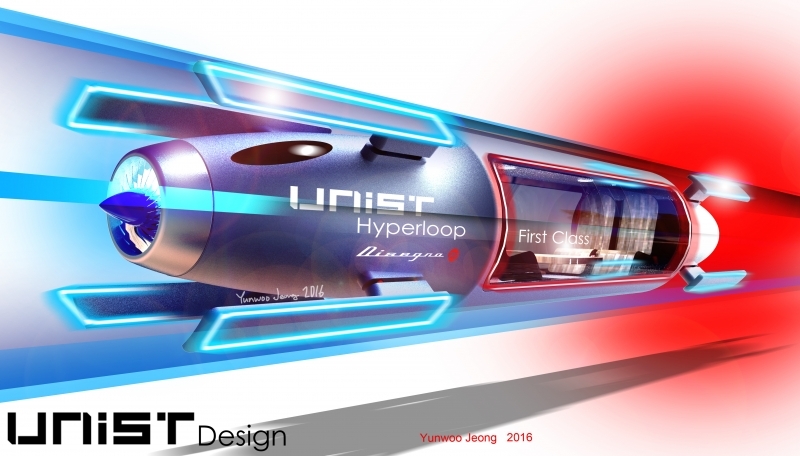 Via tantatively named “U-Loop Project“, a highly innovative research team at UNIST will make proactive efforts to develop essential elements of the Hyperloop technology, such as Air Reduction System and Propulsion Control System in a bid to transform the Hyperloop from bold vision to reality. About one billion KRW has been committed to the project for the next five years. In addition, a group of 7 UNIST researchers shall partake in the project. One of the biggest challenge to overcome with the Hyperloop is to reduce the friction and air resistance associated with a capsule moving through a tube. In an attempt to alleviate some of these challenges, the U-Loop Project team will place air compressors at the front and inside of the capsule to actively transfer high pressure air from the front to the rear of the vessel, resolving the problem of air pressure building in front of the train, slowing it down. This will not only minimize air restriction and noise, but also allow for higher speeds. Prof. Johannes Kluehspies (Deggendorf Technical University) is presenting at the 1st International Symposium on Hyperloop on July 21st, 2016. The levitation propulsion system, proposed by the U-Loop Project team is different from Elon Musk’s low air-pressure tube system, yet will utilize magnetic levitation method. The maglev transportation system will provide a lifting force to allow trains to move inside the vacuum tube while floating in the air. However, such method has one downside which is the high cost to supply electricity. To contribute to the high cost of generating power, solar power batteries will be installed on the top of the tunnel.